Snoring during pregnancy – What could be the cause? Morning sickness, fatigue, and unusual food cravings are all common and often anticipated side effects of pregnancy. However, the occurrence of snoring, on the other hand, leaves most pregnant women confused and usually concerned. If you are pregnant and have recently started snoring, you may find comfort knowing that over 25% of women begin to snore at some time during their pregnancy. This percentage increases after entering the third trimester of pregnancy. Snoring during pregnancy not only has the potential to keep your bed partner awake at night, but it may also be a sign that an underlying medical condition may exist. This could be obstructive sleep apnea, a sleep-related breathing disorder in which your breathing becomes shallow or often ceases several times during the night. Due to the potential of such a condition existing, it’s especially important to discuss the onset of snoring during pregnancy with your doctor to rule out the possibility of a more serious condition. What are some common causes of snoring during pregnancy and how can you reduce or prevent the snoring? A likely culprit of this bedroom nuisance is simply weight gain. It’s not uncommon for women to gain an excessive amount of weight during pregnancy. In fact, nearly 50% of American women who become pregnant are considered overweight while pregnant. In general, those who are overweight tend to accumulate excess fat and tissue in the neck area. As a result of this excessive material in the neck area, the airway can become constricted and tissues in the airway begin to collide with each other which causes the sound of snoring that we are familiar with. This may leave you wondering how much weight gain is too much? According to the United States Institute of Medicine, this will vary depending on your normal weight prior to pregnancy. Women who are of normal weight should aim for a gain of between 25 lbs to 35lbs while overweight women should gain between 15lbs to 25lbs. Those who are typically obese should consider gaining only 11 lbs to 20 lbs. In other words, the more you weigh prior to becoming pregnant, the less you should gain during pregnancy. Swollen and inflamed nasal passages may be the cause of snoring during pregnancy. Excessive mucus production and nasal passage swelling are common during pregnancy due to an increase in estrogen. Blood vessels in the nose tend to swell which causes inflammation in the nasal passage. Swollen nasal passages restrict airflow and sometimes completely stop airflow through the nose. As a result, snoring will occur as air passes through the narrow opening. Aside from weight gain, nasal passage inflammation is one of the most common causes of snoring in pregnant women. As your baby grows it will inevitably place pressure on your diaphragm which will make breathing more of a challenge. This pressure will cause restricted breathing which may ultimately cause snoring that did not exist prior to pregnancy. With each passing day, the fetus grows larger, resulting in more pressure against the diaphragm. This is perhaps why snoring is most common in the third trimester as the baby has grown to a considerably large size. Stress can cause a number of different symptoms regardless of your pregnancy status. 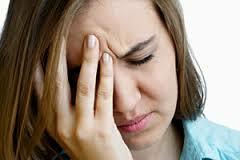 Stress is often an overlooked factor when it comes to many different conditions including snoring. Unfortunately, pregnancy can be a stressful period of time due to all of the unforeseen events that can occur within the nine-month period. Combine this with the anxiety of anticipated childbirth and you have several factors that can lead to high levels of stress. So how does stress cause snoring? It’s well known that stress can affect the rate at which we breathe. An increased rate of breathing along with other factors (such as inflamed nasal passages or relaxed excessive tissue in the throat) can ultimately lead to snoring. You may not know this but alcohol, tobacco, and sedatives such as sleeping pills can all cause snoring as they relax the throat muscles. Being that we are in the 21st century, we all should be well aware of the problems associated with the use of these products and issues with childbirth. Just in case, avoid all three as they not only cause snoring but also greatly increase the risk of your child being born with a birth defect. How can I stop the snoring? Now that we have addressed some of the common causes of snoring, let’s consider some possible solutions to prevent the snoring. While you may not be able to completely stop the snoring, you may be able to greatly reduce the severity and frequency of it so that you and your partner can get a full night of rest. Let’s start by addressing the most common cause of snoring during pregnancy – weight gain. I know what you are thinking “but I’m eating for two, of course, I’m going to gain weight”. While this may be true, you should still attempt to stay within the recommended weight range for your body type. As previously mentioned, this should be between 25 lbs and 35 lbs. This amount should be even less if you were overweight or obese prior to becoming pregnant. Before changing your diet, be sure to speak with your doctor and perhaps a dietitian to determine the best course of action to help you to achieve optimal weight while ensuring that your baby is getting proper nutrients that it needs to develop. It’s fairly safe to say that you should eat less processed foods including doughnuts, ice cream, potato chips, cheesecake, and brownies and eat more wholesome fruits and vegetables. Inflamed nasal passages are going to occur regardless. 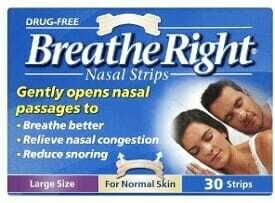 One solution may be to use nasal strips such as those made by Breathe Right. These flexible strips adhere to each nostril and use the bridge of the nose to create a “spring” action which pulls the nasal passages open. As a result, the nasal passages open up and air flows freely. It’s important to remember that these will only be effective if the snoring originates in the nasal passage area. A 10 pack of these can be purchased for around $5 at your local Walmart, Walgreens, or CVS. If they work, large packages can be purchased at a lower cost per unit. A change in sleeping position may be all that it takes to stop the snoring. Try sleeping on your left side with your head slightly elevated. Sleeping on your back will actually increase the intensity of snoring as gravity causes the tongue and tissues to fall back into the airway. Sleeping on your side prevents this from happening. You may also want to try sleeping with a specialized pillow which will help to elevate your head and make sleeping on your side more comfortable. 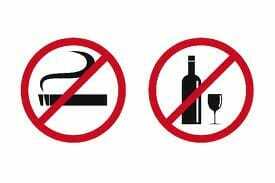 It goes without saying that you should not consume alcohol, use tobacco or sedatives while pregnant. There are of course several reasons for this, snoring being one. Finally, you may want to consider a snoring mouthpiece. These simple devices are usually custom fitted and can be placed in your mouth before going to bed. 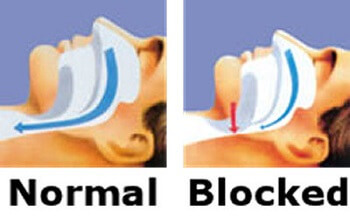 They work by holding the lower jaw slightly forward which helps to keep your airway clear of obstruction. A variety of manufacturers make this product but almost all work by using the same principle. One product, in particular, is the Joy mouthpiece. The Joy helps to prevent pregnancy snoring and can also be additionally used as a birthing mouthpiece which can actually shorten your delivery time while giving birth. Learn more about the Joy Mouthpiece and how it can benefit you. Whichever solution you choose, ensure that you first speak with your doctor, especially if you wake up tired and with frequent headaches as this may be a sign of a more serious condition such as obstructive sleep apnea. Pregnant Snoring – Is it ok and will it stop after delivering? Will Losing Weight Help to Stop My Snoring or OSA? 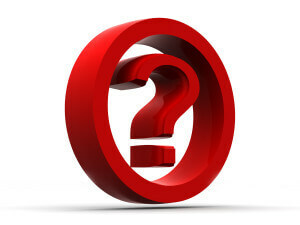 Next post: Atqol Antisnor Ring Review – Can a ring really stop snoring?